Backpacks on dogs are increasingly popular. For neighborhood walks, backpacks provide a sense of purpose, and encourage dogs to focus on the task at hand, expending more energy on their walks than they would without the backpack on. 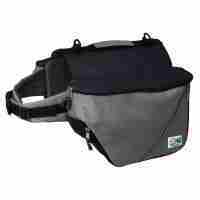 Additionally, backpacks can have a calming effect on dogs with fear aggression. They seem to work much the same way the ThunderShirt does, by wrapping the upper body and applying the same soothing pressure to it. For those who love to camp and bring their best friend along, backpacks allow your dog to carry his own weight. 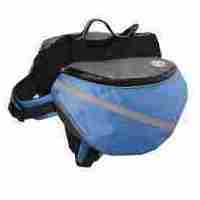 Water, food, bowls and treats can be easily stored in the saddlebags. Prepare your dog for long excursions by starting out on short walks with an empty pack, then gradually increase the load.